The news is getting more worrysome every day. Signs confirming a possible “breakdown” during the upcoming decades are multiplying: climate change, irreversible loss of biodiversity at unseen scales, dispossession of indigenous people and small producers, concentration of land in the hands of minorities that are moved by an irresistible will of accumulating profit and appropriating natural wealth, but also heightening of tensions and conflicts in many places all over the world in order to control raw materials or around migration movements that are growing in direct relation with the deepening of inequalities. In the last fifteen years, governance of the earth and of the natural resources that is at the heart of the work of AGTER’s international network has become a major topic for mankind. In this newsletter we display three co-publications of AGTER and FAO, the United Nations organization for Food and Agriculture, regarding the evolutions of land access in Western Africa, South Asia and Latin America. They have been written in the context of the World Forum on Access to Land organized in 2016 by AGTER and CERAI with numerous supports including the one of FAO. You can also read a series of AGTER members’ interviews about the commons. Beyond the researchers and scholars’ works, the need of getting back to the commons is one of the actual topics for all of us. It forces us to forget about numerous misleading words and concepts that are permanently used. The speech addressed by the French Government to the occupants of Notre Dame des Landes perimeter (area of resistance against the construction of a new airport in the Western France bocage) is a good example for this. After a very violent intervention of the security forces the Prefecture accepted to negotiate with the illegal occupants but only based on individual agricultural establishments. However multiple legally recognized structures of collective production or management of natural resources do exist in France. Invoking an obligation of solely individual properties is but a coarse manipulation aiming at providing an excuse to justify again the use of force, while the stakes can only be to demonstrate to public opinion how firmly the government acts in case of disorder and everything the state’s representatives wrongly call “anarchy”. One cannot avoid thinking of the “real” socialist governments who rather negated individuals and imposed full collectivization to the beneficiaries of agrarian reforms. Below we re-publish an article from our documentary resources site that was written 30 years ago about Latin-American experiences (available in Spanish and French). The approach was identic to the actual one of the French government, a negation of this contradictory reality that permanently links the individual and the collective, but then for the benefit of collectivization. Consequences of those absurd views are well known, long lasting and significant: totalitarianisms, be they neoliberal or « socialist », agricultural and ecological failures, human catastrophes and political fiascos. Developed societies more and more admit multiple potential uses on a given territory. This is indeed what happens in France despite the government authorities’ statements. It is also happening in Switzerland, which implemented the “Cadastre des Restrictions de Droit Public à la Propriété Foncière” (Land Register of Public Law Restrictions to Land Ownership). Laws and governance mechanisms allowing the implementation of resources utilization systems that are sustainable only exist partially. A large part still needs to be invented and experiences like the one in Larzac in the 1980ies or Notre Dame des Landes today contribute to this invention. Laws are also built bottom up, based on the people’s experimentations, not only on parliamentary commissions and lawyer’s works. Treating the inhabitants of the ZAD (Area to be Defended) as delinquents is not only unfair as their action triggered the abandonment of a “climate-threatening” airport project, it is also absurd for a government that plans to elaborate new legal frames regarding agricultural land. We urgently need to stop police repression in the ZAD and give the inhabitants enough time to serenely define, together with governmental institutions, the organization and management structures that will ensure the best development of the zone, for both local people and French population as a whole. To be found hereafter: a re-publication of the “call of the hundred names”, it is dated one week ago but still totally relevant. We also publish again a support communiqué issued by today by Organizations of Civil Society, and signed by us. During all 2018 the AGTER team together with SCAFR – Terres d’Europe (international design office of the SAFER’s) do facilitate a thinking exercise about the consequences of agrarians structures evolution and on young people’s land access on behalf of the Comité Technique Foncier de Développement (Land Technical Committee for Development), a think-tank that supports French cooperation in strategy and land actions supervision, together with numerous French and foreign actors. Read here the description of this work stream (in French). In our newsletter, we will publish the conclusions of this work as soon as available. We also pursue the publication of the 2016 World Forum on Access to Land (WFAL 2016) outputs and we recommend you to view below three new interviews of: Massa Kone (Speaker of the Malian Coalition against land grabbing) in Mali, Pedro Arojo (Diputado de Podemos, Provinzia de Zaragosa, Espana) and of Doung Samphors (Director of Satar Kampuchea, in Cambodia). The contributions we can provide with our small resources are limited and have little weight facing the huge media machines. As you read this Newsletter that is issued in French, English and Spanish and distributed to 3000 readers, you can contribute to make our work known by forwarding it, by urging your friends to subscribe, and you can of course contribute directly by getting in touch with us. We do not register anyone without previous agreement. 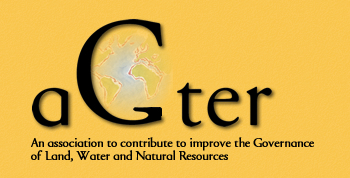 In order to receive this newsletter, go to www.agter.asso.fr and register directly.